Yarbi Design: Bienvenue! Welcome! Kend Kende! Welcome to our new blog. We've been talking about needing a website recently and thought this was a good alternative for the time being. Hopefully, folks will learn a bit more about African art, fair trade and la vie in Burkina Faso in general. Bienvenue. 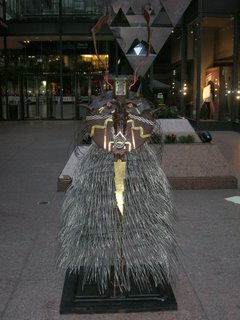 Rabi participated in the 6th Annual Art of Recycling Metal Sculpture Art Contest a few weeks back for the Aquatennial. He made the "Rain Mask." He won the Honorable Mention and the Scappy Award, which is the American Iron employee's choice award. 43" x 36" x 87"
We met fellow sculputor Jeff at that event. He's the one that suggested we try a blog. Check out his new blog as well. Thanks Jeff! Hope you enjoy. Please give us constructive criticisms on any pieces posted.